There may be better ways to celebrate a 67th birthday, but Tim spent his at a very wet Oulton Park in Cheshire, where in qualifying he put the New Elms Class C Plus 8 on class pole by over 2 seconds! 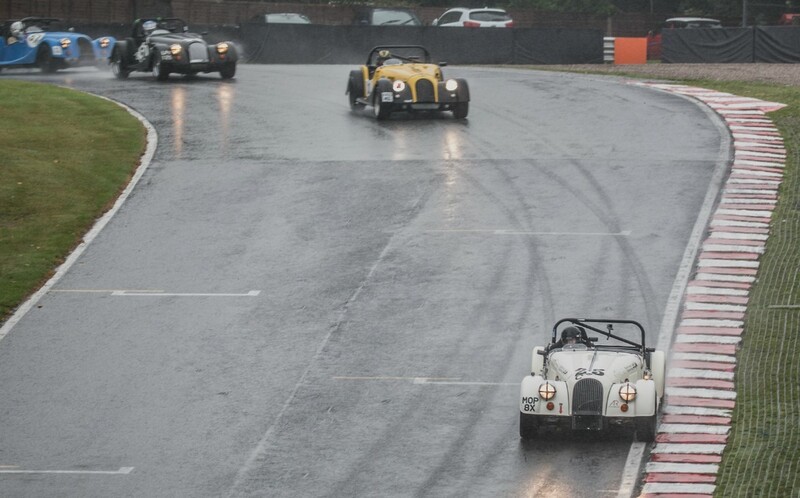 The rain got even worse for the 30 minute race but most drivers managed to stay on track! Tim’s birthday present to himself was a Class win, but sadly not fastest lap. That went to Phil Tisdall by a fraction of a second. With two rounds remaining Tim is in prime position for the Class C Championship win, and barring disasters, second overall to the talented Elliot Paterson, who looks like claiming the Championship and “Peter Collins Tray”, five years after Tim beat Elliot’s father Russell to the top spot on the Championship podium. Next round is our first visit to Mallory Park in Leicestershire on 24th September.